My university’s patroness is Minerva, the Roman goddess of wisdom who was syncretized with the Greek Athena. Her statue guards the main campus from behind the library, and students (including me) offer apples and coins to gain her favor. Since I’ve made a point of performing this ritual every time I am on campus, my academic life has become far less stressful. Scheduling tangles just seem to work themselves out somehow. Grades come back higher than anticipated, and my coursework is for some reason not the burden it used to be. 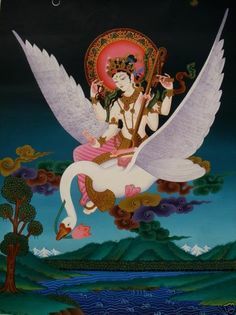 I will be honest and say that I still fear reaching out to deities other than My Lady Saraswati Devi. It’s not the rejection I fear, but frankly acceptance. I worry that I will become one of those people who sort of hops around from deity to deity, chasing shiny things and new experiences without ever putting down strong roots. Yet my experiences with Minerva have helped to calm this fear. I honor her and respect her, but my heart remains with My Lady.